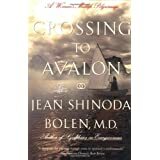 Crossing to Avalon: A Woman's Midlife Quest for the Sacred Feminine ReviewWomens' wisdom & ways of knowing are almost always discounted by the male-dominated world. The Kirkus Review says, "... quickly degenerates into pop psychology and pseudo-profundities." Why do supposedly intelligent people bother to negate what's profound for someone else? A simple statement that the profundity was lost on you would suffice. That said, I found this to be a glorious book about a woman's pilgrimage in midlife that changed her deeply and will affect the rest of her life. Women need to hear womens' stories. It's what we've always done & hopefully will continue to do and benefit from. I found her descriptions of the places she visited absolutely lovely and enriching. Without her extremely intimate perspective, this book would only be an interesting travelogue - not something that inspired me to listen to myself and my body! To know that my perspective may help someone else clarify theirs is reason enough for me to say all women everywhere should read this one, and share it with the people in their lives. Want to learn more information about Crossing to Avalon: A Woman's Midlife Quest for the Sacred Feminine?